War in Mind is a new project from Spaniel in the Works Theatre Company looking at the legacy of World War One. The project involves workshops and performances and explores lives affected by shell shock including the sufferers, doctors and those whose mental state was not recognised in particular the families left at home. As part of the project we will be running workshops in archive research and printmaking. Details of workshops and performances can be found below. This new powerful dramatic performance looks at the real lives of people affected by shell shock in the First World War. 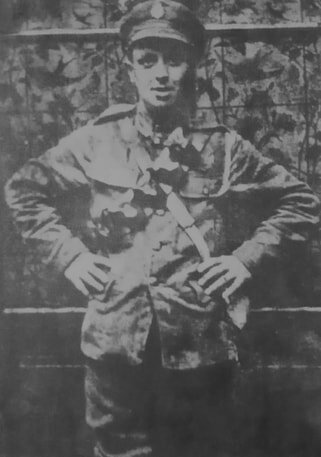 Doctor Harold Hills, later to be a Stroud doctor, who worked with sufferers at the Front and prevented many men being shot for desertion through his testimonies. ​Based on archive records and through research War in Mind looks at the treatment for sufferers, the problems for families and the stigma attached to what is now known as Post Traumatic Stress Disorder. Friday 12th April 2.30 p.m and 8.00 p.m.
Friday 10th May 8.00 p.m.
Tuesday 14th May 8.00 p.m.
Wednesday 15th May 2.30 p.m., 8.00 p.m.
Friday 17th May 8.00 p.m.
Saturday 18th May 2.30 p.m., 8.00 p.m.
Monday 7th October 1.30 p.m., 7.00 p.m.
Sunday 17th February 1.30 p.m. Inspired by the linocuts of William Kermode this workshop will introduce simple ways to create new prints using recycled polystyrene and paint. The workshop is suitable for families with children over 9 and will look at images from World War One to create powerful prints using simple techniques and materials. Saturday 23rd March 1.30 p.m.
Sunday 24th March 1.30 p.m.